The marksmanship skills of the Marine Corps rifleman are legendary. In no other service do recruits recieve such exacting training with the rifle as do those who undergo Marine Corps training. A Marines expertise with the rifle is gained from learning the strict fundamentals of Marksmanship which are taught along with the discipline to master these concepts. 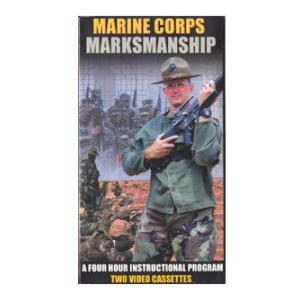 In this four hour program, you will learn the proven techniques taught to Marine recruits durring their three weeks of their intensive Marksmanship training. Two VHS tapes.